Home > Report of the Steering Group on the Mid-term review of the National Drugs Strategy 2001-2008. Steering Group for the Mid-term Review of the National Drugs Strategy. 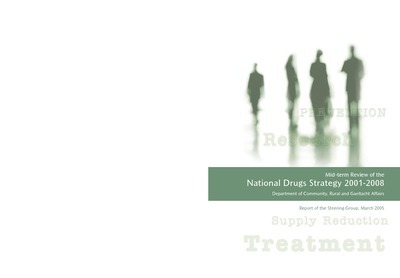 (2005) Report of the Steering Group on the Mid-term review of the National Drugs Strategy 2001-2008. Dublin: Department of Community, Rural and Gaeltacht Affairs. 2004 marked the half-way point of the Strategy and a mid-term review was initiated in June last year. The review was overseen by a Steering Group chaired by the Department of Community, Rural and Gaeltacht Affairs.